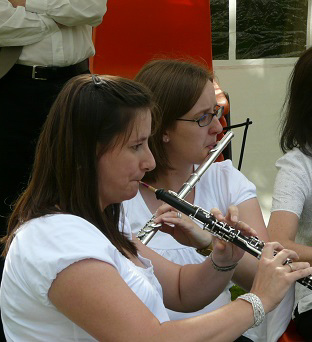 Formed in 1999, the RCO is led by local professional musician and music teacher Ian Riley in a relaxed, informal and friendly environment. Our members include children and adults with an age range of over 70 years! Some are learning to play, some have dusted off an old instrument from the attic and others are very able musicians keen to pass on their skills. Our repertoire is mixed including classical, film themes, musicals, pop and rock scores, folk and jazz. Ian studied piano at Leeds College of Music. His professional engagements include musical director for the Moscow State Circus, 20th Century Musical (European Tour) and working with such stars as Jimmy Tarbuck, Linda Nolan and many star-studded pantomimes. Maggie (violin) joined the orchestra around 15 years ago. She undertook the role of Secretary for around 8 or so years and was elected chairman in 2016..
Julia, long-standing Roade Community Orchestra member has been the treasurer for a number of years bringing her finance expertise as an accountant to the committee. Oliver is a flautist and has been a member of Roade Community Orchestra for 2 years and has recently taken on the role of secretary.